Bad weather makes for good memories when you're dressed for the conditions. 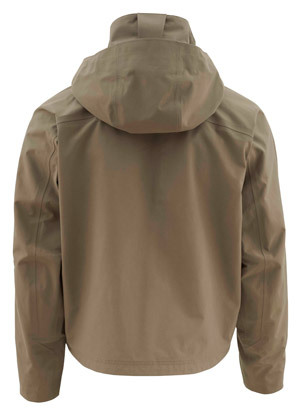 Our men's Guide Jacket makes wet, moody days on the river memorable for the right reasons. It keeps you dry and warm while you enjoy having the water to yourself. The GORE-TEX® shell fabric breathes and sheds rain and snow, while the watertight Shingle Cuff™ has a low-profile design for snag-free casting that also prevents up-sleeve water migration. Top-loading pockets are fly box compatible and there's a Tuck-Away fly patch for easy access to your favorites. The jacket's cut supports a full range of motion for natural casting, and there's a high collar and stowable hood for full shelter from the storm. The GORE-TEX® membrane is the heart of all GORE -TEX® products. The GORE-TEX® membrane contains 9 billion microscopic pores per square inch. These pores are so small that water droplets cannot get through but water vapor can still escape. Water from the outside cannot penetrate and cold winds cannot pass through, but perspiration can escape easily, keeping you dry and comfortable all day. GORE-TEX® fabrics are created by integrating the GORE-TEX® membrane between an outer fabric and lining.